Turning off your water as easily as turning off your lights…. The Surestop – turning off your water as easily as turning off your lights…. Burst pipes, leaks and easy access for a poorly situated stopcock are all problems that can cause at the least, inconvenience and at worst water damage and a large bill. In fact, in December 2010 there were over 100,000 insurance claims in the UK for burst pipes and water leaks with an average cost of £6700.00. In most properties, the stopcock is either hidden away at the back of a cupboard or hidden behind furniture and in some cases, the homeowner may not even know where it is. This can be a problem when you want to turn off the mains but a catastrophe if there is a burst pipe or leak with water cascading down the walls. 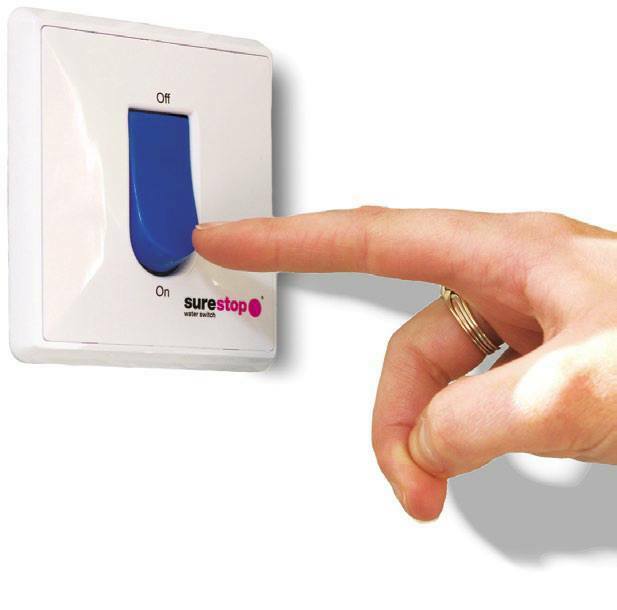 With Surestop turning off the mains water supply can now be done with a flick of a switch. With a range of British designed and manufactured switches, both on-pipe and remote, that use nothing more than water pressure to isolate the incoming mains water supply (so no batteries or electricity) there is a Surestop to suit every need. Easy access in the case of an emergency. Easy operation, just a simple switch, and no more weeping stopcock spindles and stuck valves. Peace of mind when leaving their property (home, caravan, boat, business etc). No more struggling to turn off a difficult or stiff stopcock. Can be fitted on the pipe itself or remotely on an adjacent wall or surface. Surestop stopcocks are a low-cost solution to the many problems associated with traditional brass stopcocks and a perfect addition to any job of any size that will benefit both the customer and engineer. * Research undertaken by Halifax Home Insurance. ** Research undertaken by AA Insurance Services. *** Industry statistics provided by the Association of British Insurers. **** Figures provided by The British Insurance Brokers’ Association. Boiler Plus – What is all the fuss? The Government has recently launched a new initiative, Boiler Plus which is designed to encourage energy efficiency in domestic premises. The most common options are the load compensations devices (such as compatible Manufacturer controls) or smart heating controls such as Nest or Hive. What if I do not want a new control? Unfortunately as this is now part of Building regulations and any installer who fails to install a new boiler in line with these rules will be breaking the law. Also, any homeowner who knowingly allows non-compliant work to be carried out could also face prosecution and fines of up to £5,000. Why are these new rules being introduced? This legislation has been introduced to help the UK meet their carbon emission target by 2020. It is part of a broader ranges of changes that have been added to the existing regulations over the last few years. For more information, the HHIC have created a consumer guide to the changes which can be downloaded here – HHIC Boiler Plus Consumer Fact Sheet. Although we are open, quite a lot of staff are taking holidays so we will be working with reduced numbers. All days except the Public Holidays will have the normal emergency engineer out of normal working hours cover. Days marked with an asterisk (*) may have slightly earlier closing times than normal. How to thaw a frozen condense pipe. Although the winters for the past few years have not been especially severe, there is always a chance of a few freezing days. If the temperature remains at or below freezing point, some boilers installations may suffer from a frozen condense pipe. The outside temperature is below freezing and has been for 24 hours or more. The condense pipe from your boiler (white plastic pipe that connects the boiler to a drain or soak-away) is outside. The condense pipe which is outside is 22mm (can happen with bigger pipes in very cold weather). The boiler tries to start but quickly stops or locks-out. Boilers older than 15 years probably will not have a condense drain pipe. Most modern installation (especially in the last few years) will either NOT have an external condense pipe OR increase the external pipe size to 1″” or more. 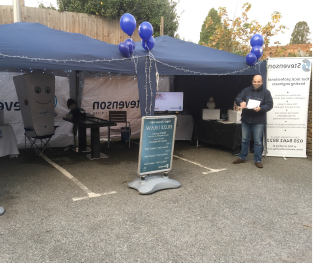 An electric boiler can replace any other small to medium size boiler in the home, and are known to be light, small and compact, often completely silent and, of course, boasting the main benefit of a low running cost due to the price of electricity in comparison to oil or gas. Since they only heat up a certain amount of hot water at a time, an electric boiler might not be suitable for larger households with higher levels of hot water usage, but are ideal for small properties.